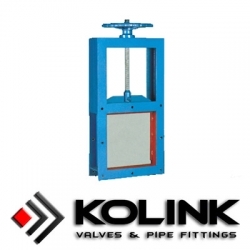 Square guillotine valve is a special type of knife gate valve. It is mounted on square or rectangular pipes, normally water or waste water pipelines. The valve body of square guillotine valve is normally fabricated, and could be tailormade to various sizes. On the other hand, the design of square guillotine valve is based on low pipeline pressure. It is not recommended to use square guillotine valve in pressure higher than 6 bar. Materials of valve body: Mild Steel, Stainless steel 304, 316, etc.